We are acknowledged as a leading organization, engaged in offering a wide range of Magnetic Stand to our prestigious clients. 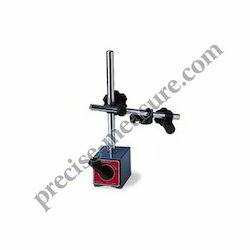 The products offered by us are used in clamping and holding of measuring tools. These stands are throughout checked under the supervision of our quality inspectors in order to meet defect free products. Magnetic stands accept all dial indicators and dial test indicators. The ON / OFF switch offers instant mounting and dismounting without any adverse effect to the indicators or work surface. Clamping stem diameter of 4.5mm to 8mm. 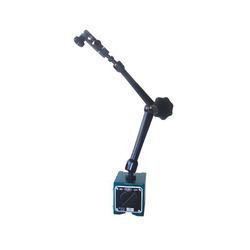 For digital and dial indicator and dial test indicator we offer magnetic stand, universal magnetic stand, magnetic stand for uneven surface, vacuum stand, universal stand, flexible arm magnetic stand, mini magnetic stand, dial gauge stand, comparator stand. Compact and universal permanent magnetic stand. High magnetic power for maximum rigidity. Includes disc on bottom for neutralizing magnet when not in use. WATER VITALIZER: It give you charged water. Need of magnetic Charging: Our water comes from natural sources. Through iron pipes and tanks. Due to this natural magnetic charging is disturbed. Use this re-energizer and feel the difference in vitality. Magnetic Dial Stand are easy to use, posses a high magnetic power and are known for Good tensile property & resistance against chemicals, heat & humidity. Our stands are made using sophisticated technology and high grade raw material. The products are delivered in a hassle-free manner and within committed time frame. Usage: Advertising, Promotion, Backdrop, Trade Show etc.